GENEVA, Switzerland, August 18, 2014 (ENS) – The numbers of reported Ebola virus cases and deaths “vastly underestimate the magnitude of the crisis” health workers at Ebola outbreak sites in four West African countries have told the United Nations World Health Organization, WHO. 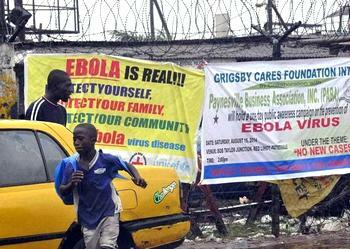 The deadly virus is spreading in Guinea, Liberia, Nigeria and Sierra Leone. At the same time, health workers have been are being threatened and harassed as they work around the clock to stop the deadly disease from spreading, WHO officials say. These professionals are taking personal risks to provide critical medical care, but have been threatened, shunned and stigmatized. “Doctors, nurses and other health workers must be allowed to carry out their life saving humanitarian work free of threat of violence and insecurity,” WHO Director-General Dr. Margaret Chan said today. 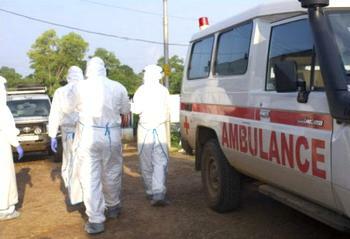 But in Monrovia, Liberia on Saturday, 17 Ebola patients fled a quarantine center after it was attacked by club-wielding youths, claiming that Ebola is not real. Wild rumors proliferate that the virus was invented by the West or is a hoax. A Liberian Health Ministry official, insisting on anonymity, said the youths took medicines, mattresses and bedding from the high school, which had been converted into an isolation center. At the center, 29 patients who “had all tested positive for Ebola” were receiving preliminary treatment before going to hospitals, the head of the Health Workers Association of Liberia, George Williams, told reporters. Williams said that of the 29, nine people died last week, and three others were taken by relatives. The most recent statistics compiled by WHO as of August 14 show that the outbreak of Ebola in West Africa continues to escalate since it was first reported in Guinea in December 2013, with 1,975 cases and 1,069 deaths reported from Guinea, Liberia, Sierra Leone and Nigeria. WHO says this outbreak now involves community transmission in Guinea, Liberia and Sierra Leone, and recently an ill traveller from Liberia infected a small number of people in Nigeria with whom he had direct contact. No new cases had been detected in Nigeria as of August 14, said WHO officials. They attributed this outcome to extensive contact tracing and monitoring, implemented with support from the United States Centers for Disease Control and Prevention, CDC. CDC is rapidly sending more disease-control experts to the four nations currently reporting cases, with 50 additional disease control experts scheduled into the region within 30 days to join the 31 experts now in the four affected countries. This sustained, agency-wide response will continue until the outbreak is under control, an effort expected to take three to six months, projected Frieden. The White House, the U.S. Food and Drug Administration and WHO all have approved the request for sample doses of an experimental serum to treat Liberian doctors who are currently infected with the deadly virus. The approval comes in response to an August 8 communication sent to President Barack Obama by Liberian President Ellen Johnson Sirleaf requesting the experimental serum for affected Liberian doctors. In West Africa, CDC disease detectives are directing efforts to pinpoint cases and their contacts using a new tool developed at the CDC. This Epi Info viral hemorrhagic fever application speeds up one of the most difficult parts of disease detection – finding everyone exposed to the virus. Other CDC experts will educate the general public about how to avoid Ebola infection; ensure that healthcare personnel strictly follow protocols that protect them against infection; strengthen laboratory aspects of the response; and improve communications among all stakeholders – the public, patients and their families, healthcare workers, governments and non-government organizations, and the media. CDC is equipping the hardest-hit countries with computer hardware and software that will soon allow real-time reporting of cases and analysis of trends, according to the UN agency’s update. In the United States, the CDC has updated infection-prevention protocols for hospitals where travelers with suspected Ebola exposures may appear for treatment; for aircraft crew and airport personnel; and for laboratories handling specimens from suspected Ebola cases. On the humanitarian side, the UN World Food Programme is delivering food to the more than one million people locked down in the quarantine zones, where the borders of Guinea, Liberia, and Sierra Leone intersect, and several countries have agreed to support the provision of priority food staples for this population. Workers with the UN Childrens Fund, UNICEF, say Ebola survivors can play a valuable role in dispelling myths and in gaining community support in the fight against Ebola. While many survivors fear stigma, some are now coming forward and telling their stories, wrote UNICEF consultant Jo Dunlup in a blog post from Sierra Leone. WHO said it is mapping the outbreak in great detail, to pinpoint areas of ongoing transmission and locate treatment facilities and supplies. WHO Director-General Dr. Margaret Chan in Geneva regularly meets with ambassadors from United Nations missions based in the Swiss city to identify the most urgent needs within countries and match them with rapid international support. UN Secretary-General Ban Ki-moon has appointed Dr. David Nabarro as senior United Nations system coordinator for Ebola, in support of the work done by the WHO team. Dr, Chan has expressed its disappointment that airlines from Kenya and Cameroon have stopped flying to the four affected West African countries, saying it is hard to save lives if health workers cannot get in. WHO is requesting affected countries to conduct exit screening of all persons at international airports, seaports and major land crossings, for unexplained febrile illness consistent with potential Ebola infection. There should be no international travel of Ebola contacts or cases, unless the travel is part of an appropriate medical evacuation. Non-affected countries need to strengthen the capacity to detect and immediately contain new cases, while avoiding measures that will create unnecessary interference with international travel or trade. WHO is not recommending any ban on international travel or trade, in accordance with advice from the WHO Ebola Emergency Committee. WHO has repeatedly explained that the Ebola virus is highly contagious but not airborne. Transmission requires close contact with the bodily fluids of an infected person, as can occur during health care procedures, home care, or traditional burial practices, which involve the close contact of family members and friends with bodies. The incubation period ranges from two to 21 days, but patients become contagious only after the onset of symptoms. As symptoms worsen, the ability to transmit the virus increases. As a result, patients are usually most likely to infect others at a severe stage of the disease, when they are visibly, and physically, too ill to travel.